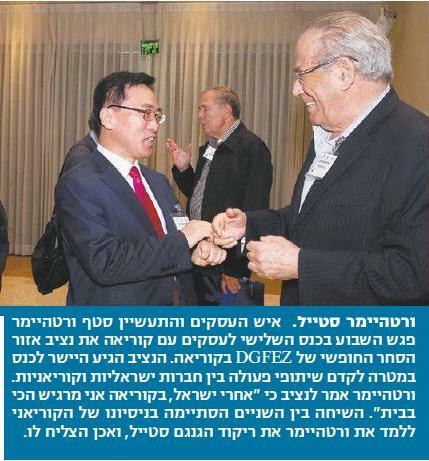 Hosted by The Israel Export Institute and YONACO Group for the third time the Annual Conference for Business with Korea in Israel took place on December 3th, 2012 at the The Leonardo City Tower Hotel in Tel-aviv. About 300 leading Israeli executives and entrepreneurs from various industries, as well as few delegations from Korea were guests in this unique Korea-Israel business conference. 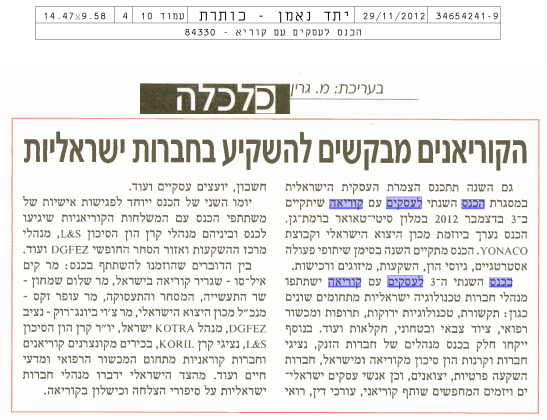 The event was extensively covered by the Israeli media . The Korea Business Conference was a two-day event. The first conference day was dedicated to lectures and panel discussions on Korea-Israel business cooperation, cross-border investments, fund raising , Mergers and Acquisitions and strategic partnerships between Koreans and Israeli firms. The second conference day was dedicated to business-to-business meetings between Israeli companies and the Korean delegations. The rest of the week was dedicated to visit Israeli companies at their locations and meeting with Israeli governmental executives. Among the notable guests at the conference this year were H.E. Mr. Kim Il-Soo, The Korean Ambassador to Israel; Mr. Stef Wertheimer, founder of the ISCAR group, which is considered one of the most successful investors in Korea; Commissioner Choi Byung-Rok of DG Free Economic Zone; Founder of L&S Venture Capital, Mr. Joo Seong-Jin; Dr. Park Joon-Seok CEO of Hanmi Medicare; the second largest pharmaceutical and medical devices company in Korea, Mr. Park Sung-Jin, a Director from SL Corporation, a leading supplier to the automobile industry and many others. This year’s event was hosted by Mr. Yigal Haccoun, Deputy Director of the Israel Export Institute.